Through knowledge and experience in a childcare environment we suggest that your child should attend nursery for at least 2 sessions a week. This is to enable your child to familiarise him/herself with the environment and staff. We also offer term time only sessions and flexible days (please contact the nursery for more information) We are open throughout the year except bank holiday’s and approximately one week during Christmas. Fees are to be paid in advance either weekly or monthly by cash or cheque. If you pay at the beginning of the month by standing order you will be eligible for a 2.5% discount off your monthly fees. A deposit of one week’s fees is required on booking, this will be held and used as payment for the final week of attendance. A fee payment is therefore due in advance at commencement of the first week. We also except all workplace vouchers. We are also aware that some families need flexible childcare, so we do offer flexible hours please ask for details. Any child who has any contagious illness will not be able to attend nursery until fully recovered, this includes any discharge from the eyes, ears or nose also sickness and diarrhoea. Children must be kept off nursery until they have been 48 hours symptom free in the case off sickness or diarrhoea. If your child becomes ill whilst at nursery you will be contacted and if we feel the child needs to be at home we will ask you to come and collect them, they will be made comfortable until you arrive. If your child has an accident while at nursery it will be recorded in the accident book and checked and signed by the manager/deputy you will also be asked to sign it when you collect your child. If your child has a more serious accident and requires urgent medical advice or treatment we will take them and contact you to meet us there. If your child requires medication while at nursery you will be asked to fill out a medication form enabling us to administer the medicine. No medication can be administered without a form being signed. We will ask you to provide sunhats and cream during the summer months for your child’s protection. 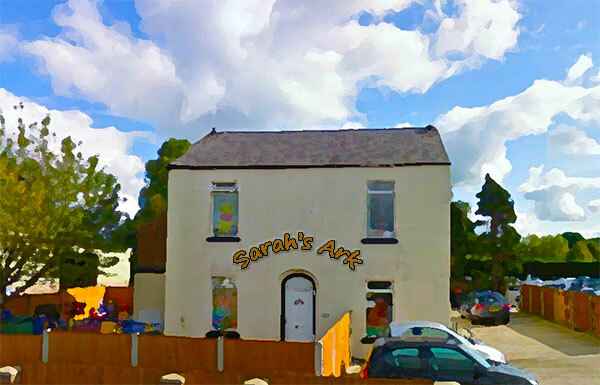 We do not require children to be potty trained at Sarah’s Ark but when you feel your child is ready to start please feel free to discuss it with a member of staff in your child’s room. If your child is in nappies you will need to supply them along with wipes and they will be kept in your child’s own drawer in the changing room. We have a no shoe policy in nursery to ensure the floors are kept clean for the children so we ask that each child has a pair of slippers to wear whilst in nursery. We would ask that all children have at least one spare change of clothing in case accidents occur. If your child is potty training you may need to bring more than one set of clothing. Please ensure that all clothing is clearly labelled. Please use the designated area for parking/dropping off. Parking at Sarah’s Ark is entirely at your own risk and we cannot accept any responsibility for injury loss or damage to either property or vehicles whilst on the car park. You should lock your car and bring any valuables in with you. Your child is your responsibility once you have collected them from us. Please drive carefully in and out of the car park, following the arrows on the golf club car park. The doors on the nursery are secured with coded locks. You must ring the bell for access to the nursery. Only parents or persons designated by parents may collect children. If someone other than the regular person is to come and collect your child please inform the nursery manager. We believe that a settling in period is best for you and your child before he/she starts, as it will let them get to know the staff and new surroundings we suggest that you bring your child for 2 one hour sessions the week before your child is due to start. You must give four weeks written notice if you wish to cancel your child’s place. We provide breakfast for the children of cereal, toast and a drink. Snacks are provided for mid-morning and mid-afternoon a light tea is also served. Formula milk and baby food is not provided by the nursery and should be brought in by the parents. If you want your baby to have our menu it can be blended depending upon the age/stage of development of the child. If you feel there may be any issues we have not covered then please do not hesitate in contacting us.